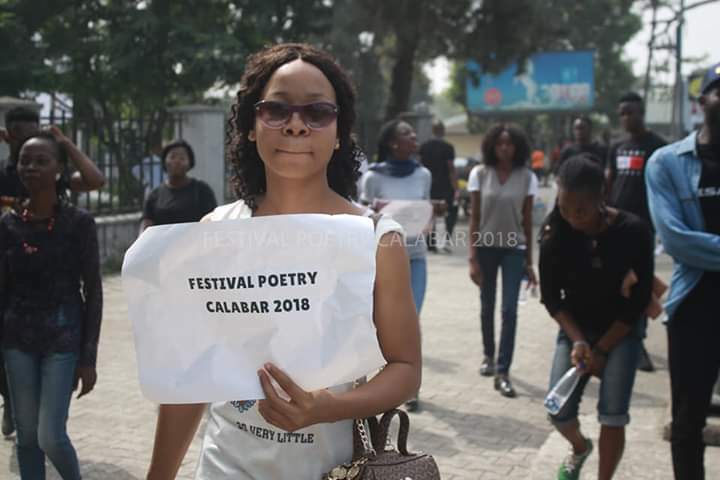 An initiative of Poets in Nigeria (PIN), the 2018 edition of Festival Poetry Calabar commenced with a maiden “Walk for Poetry” on the 19th of December, 2018. Poets from across the country who converged in the city of Calabar embarked on a Walk to create needed awareness for poetry alongside the festival. 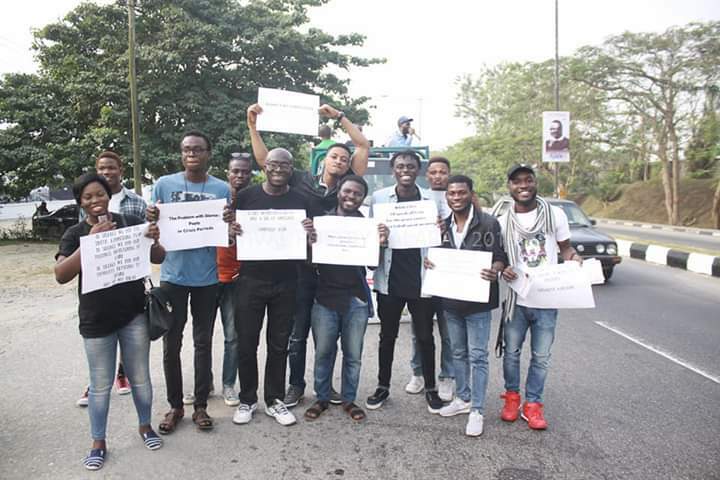 The walk was accompanied by music and poetry performances which offered many poets the opportunity of a proud show of their art as some held placards with inscriptions of poets like Eriata Oribhabor, Oddfelix Ayuk, Kolade Olanrewaju Freedom and others. The festival proper held at the James Ene Henshaw Foundation (J. E. H. F) from Thursday 20th of December, 2018 to Saturday, 22nd December, 2018 with the theme, “The Problem with Silence: Poets in Crisis Period”. In a bid to build a sustained cultural heritage which is one of the objectives of the festival, there was as it is in the tradition of Festival Poetry Calabar, an official opening tagged “Calabar Welcomes” where the artistic flavours of Calabar was displayed e.g. Efik ballad as performed by Comrade Ukeme Ekong. Her presentation came on the heels of the Chairman – Mr Bassey Asuquo’s welcome address titled “2015 and a Seed Was Sown”. Meanwhile, earlier in the morning of Thursday, a successful Poetry Workshop led by the Pioneer Lead Representative, Poets in Nigeria, CRUTECH Connect Centre, Mr. Ofem Ubi was held. Thereafter, the Human Resource Team presented beautiful gift items to the first-ten registered participants for the festival. 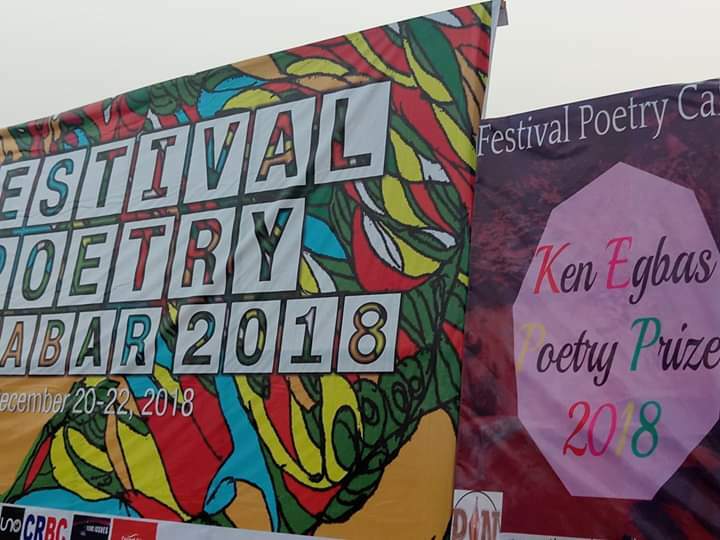 The festival also witnessed various spoken word poetry performances that drenched the hearts of many non-poets, thus engendering a longing for beauty from spilled words. Miss Resame Oyam served dinner to the entire audience with her evolvement of poetry through music as she resonated the year’s theme with her song, “The Sound of Silence “. The following day (morning of Friday) was a perfect definition of interaction and learning as the Keynote address for the festival was presented by Prof. Joe Ushie, Department of English, University of Uyo. Also, a Literary Round Table moderated by Miss Veralyn Chinenye, Pioneer Lead Representative, Poets in Nigeria, Unical Connect Centre was held. The discourse interrogated poetry for service and why budding poets must not fail to tell their stories on love, depression, and growing phenomenon of street children. Furthermore, a panel discussion was not exempted from the program because it successfully served as an instrument for effectively involving participants in the present-day literary discourse. It was moderated by Mr. Kolade Olanrewaju, Executive Secretary of Poets in Nigeria. A very lively book chat with Miss Utibe-Eno Ekpuk, Lead Representative, Poets in Nigeria, Unical Connect Centre as moderator saw open interactions with prestigious authors. The underlying reason for the discourse was to see how writings can open up voices. An exhibition of poetry broke the ice in the afternoon of Friday at the poetry gallery just after series of discussions and learning. Participants saw a display of beautiful writings and a number of amazing poetry initiatives within P.I.N. Due homage was paid to the Late Poet Laureate Ikeogu Oke, winner of 2018 NLNG Prize for Literature who passed on sometime in the year. With his poetry while alive, he lives. To maintain a quick-witted audience, there was an evening of poetry performances again. However, this was open to all interested participants unlike the restriction of “Calabar Welcomes” to Calabar residents. There was yet another panel discussion moderated by Ekaette George which discussed Calabar as a Silenced Paradise. The panelists, Mr. Joseph Okorn, Miss Brenda Effiom and Mr. Diego brought light to the topic as they drew a conclusion that Calabar is not necessarily a silenced paradise. Rather, a number of initiatives that should bring the city to limelight are run as though they are secrets and not meant to be revealed. Afterwards, there was a special package for performance poets with the prize of a N100,000 naira for three winners. This raised a heated ardor and emotions in the venue. To keep nimble the minds of participants with special regard to residents outside Calabar, there was a tour of the oldest photography studio in West Africa, Prison Wall, Old Residency Museum and Drill Ranch. Also, for the purpose of upholding the festival with a flair for hedonism, there was a stage play by the J. E. H. F centre at the return of participants from the tour. Also, the three winners of Ken Egba’s Poetry Prize for poetry were announced and their prizes presented to them accordingly. Vote of Thanks was given by Sir Eriata Oribhabor, President Poets in Nigeria. The entire Festival Poetry was bigger, better and bolder and rounded off with a bonfire night. This is wonderful….. Poetry is indeed “silence in a paradise only enjoyed where this justice”.